This topic has 29 replies, 21 voices, and was last updated 4 days ago by twohats. I’m thinking about a good climbing, stable descender with room for 2.5” tyres. Evil Calling, RM Instinct, YT Jeffsy…. What’s hot and what’s not then? I have an Evil Following so in your position would be looking at the new Evil. Also not exactly to your spec but would be considering Yeti SB 130 or the new Hope (if you can wait). Seconded on RipMo. Appreciate standard trope of recommending what you have, but I’ve had *A LOT* of bikes, and this is the best of them by some distance. Done around 1500km in the year I’ve had it. Rode Llangollen and CyB this weekend and it’s just brilliant at climbing, descending, going quite fast even with me on it. I really liked my Mojo3, but this is a better bike. I’d demo the Ripmo, Stage 5 and Jeffsy. @weeksy – I didn’t like the look of them when I first saw a pic. I’ve changed my mine now tho obviously. @chapaking – that’s a good shout. Mate has a Stage 5 and he really rates it. Rides very differently to my RipMo. Not ridden a 29 Jeffsy, lots of 27.5s in the FoD (named after a FoD rider of course). Sat on one, felt quite short but that might be previous generation. New Jeffsy looks great, the Evil Offering sounds like to could be good, albeit a bit heavy, Ripmo is almost good, apart from stupid bushes rather than bearings & slightly odd regressive leverage ratio, Fuel is good if you arn’t too tall, SB130 is a brilliant bike, but won’t fit more than a 2.4 in (and it’s a Yeti so it will probably break). 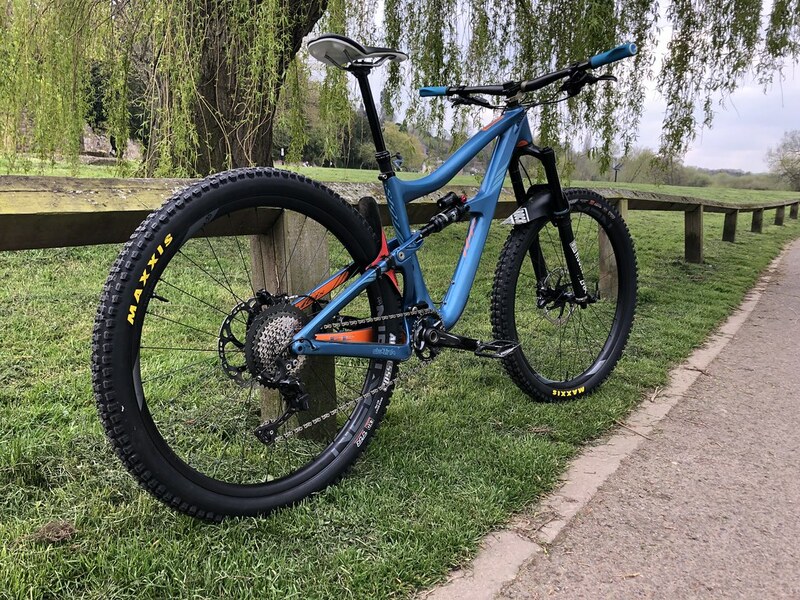 Whyte S150 C RS – Really rate mine. It’s easier to climb than my old Cotic SolarisMax LS & Whyte T130RS and descends incredibly well. It’s just got the right geometry I think. Not the lightest thing in the world, but I think most of the fat is in the wheels. Travel of the Occam TR 130/120 I think. Can’t fit 2.5’s in a Sentinel (or 2.4’s) if you hit corners at any sort of speed, or ride in any sort of mud. Find an old Trek Remedy 29 and spend the rest on hookers. Still an awesome bike. Friend of mine has bought an s150 recently. It’s like he’s found an extra gear or two and he wasn’t exactly slow before. I’m jealous. Not my own bike but have been riding one for the last few weeks and have been genuinely impressed by it. The shapeshifter tech makes it ride feel close to that of an XC bike on regular trails while boosting its climbing ability while the slack mode makes for a bike that thrives on steep, technical trails. It is the closest I have come to finding a one bike to rule them all machine. Put it this way. As an avowed hater of 1x, this bike could turn me. I am loathe to give it back. Frankly, if I had the cash, I would buy one. It is truly that good a bike. I have a Ripmo and it’s great, I rode some of the bikes mentioned before I bought, it was the most fun and one of the fastest. Hightower was bland. Evil Wreckoning was awesome on descents but pedalled terribly my knee is screwed and I need something that pedals well. SB130 was fast and pedalled well and fun but I have reservations about Yeti. Foxy 29 was probably the fastest but not so much fun, I rode an XL which was a bit big for me. Whyte S150 – love mine to bits. have been genuinely impressed by it. Does the ShapeShifter really turn this Enduro into a trail bike…? Yes it does. It reminds me of my old Trance 29 when in click (climb and XC) mode. The travel is reduced and the suspension feels like it has stiffened up, if that makes sense. It is still really comfortable to ride though. I would recommend you try one. I have to admit that I wasn’t sure what to make of the Strive before I tried it. Would it really be a best of both worlds bike? However, having given it a fairly sound thrashing, I can confidently says it does what Canyon claim. I particularly like how well it climbs on technical, singletrack climbs through the trees. I took it for a ride through Burnside in Aviemore last week and found that there was no off road climb it couldn’t get up with ease. I’ve also managed a couple of really tough local trails that I have struggled to clear even on my fat bike. The Strive got up them first time. If it was my bike, I would drop the 32t ring for a 30 or better still a 28 for properly steep climbs but other than that, it is nigh on ideal for my type of riding where I like to mix xc with steep and tough big mountain descents. Good point there, that travel is far from the whole story and some longer-travel bikes pedal really well while some shorter travel ones are soggy lumps. Orange Stage 6 is another that can double as a trail bike easily. Do you notice the weight on the strive. They come it at around 15kg (I guess small without pedals). Which is quite a bit more than an equivalent pure trail bike. Does the stumpy pedal well or just adequately? Looks good geo-wise. Trek Slash is another 150mm bikes that feels smaller IMO. Possibly the Kona process too, but not ridden one. The Evo pedals very well. Coming from years on VPP, I’d say I prefer the FSR linkage!